In sports journalism, athletes are constantly being referred to as "embattled." Perhaps quarterbacks are given this label more than any other athlete. It's safe to say then, that embattled Chicago Bears quarterback Jay Cutler is one of the more embattled people in the world. Sort of like how The Dude is the laziest man in Los Angeles county, which puts him near the front in the running for title of laziest, worldwide. Cutler is a highly talented thrower with a knack for juxtaposing every breath-catching feat with a jaw-dropping interception. It doesn't help that his default facial expression is "I am sorely annoyed that I must be in your presence right now; I'd much rather be yelling at my pool cleaner. Oh, and I just ate something sour and am considering spitting it out." It seems, though, that that's just the face God has given him. The problem is that we've somehow convinced ourselves that quarterbacks mill around at one level until they have a notably impressive game or season and establish a permanent new level of play, like they were characters in an RPG. That's nonsense, but we've spent the majority of Jay Cutler's career trying to pinpoint the moment in time when he took that big leap forward. 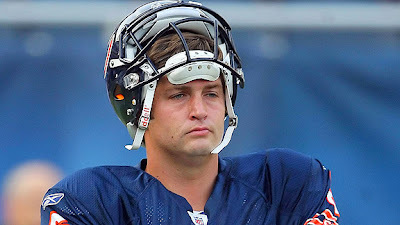 We were sure Cutler had emerged as a franchise quarterback when he won that epic 39-38 game over the division rival Chargers in 2008. 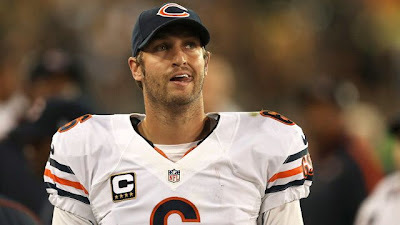 We were positive Cutler had taken the leap when he pushed a team whose most notable receiver was Devin Hester to an 11-win season and the NFC Championship Game in 2010. And we were definitely 100 percent onboard with the new Jay Cutler who led his team to a five-game winning streak last year just as he suffered a season-ending thumb injury. We keep telling ourselves that we've found the real Cutler, a guy who has eliminated his old faults and won't go back up the pipe to World 1-1. The reality is that Cutler has followed up each of those big moments with disappointments, and we've used them as proof that Cutler's really a fraud and that those triumphs weren't actually meaningful after all. That shouldn't be a referendum on Cutler. It should be a referendum on us, the fans who are reading good and bad games as unassailable proof of Cutler's ultimate value as a player when they're really just peaks and valleys. In his Nicomachean Ethics, Aristotle argued that you could tell what kind of a person someone was by evaluating their actions. Does good things? Good man. Does bad things? Bad man. This is what Barnwell argues we do with Jay Cutler: throws touchdown? Good quarterback. Throws interception? Bad quarterback. Since Cutler does both of these things (though, as Barnwell notes, Cutler's "peaks and valleys tend to be more extreme...than they are for other players") we constantly flip back and forth between regarding him as a quarterback who has "finally figured it out" and one who won't ever "figure it out." We never attempt to get down to the root of the man because we are blinded by Aristotle (slightly more specific than being blinded by science itself). It is as hard for us to accept a person doing both good and bad things as it us for us to accept a quarterback who throws both touchdowns and interceptions...but of course this is the way things are. Quarterbacks (even Tom Brady and Peyton Manning...see Monday Night's game) throw both touchdowns and interceptions. People do both good and bad things. We must be considered more thoughtfully. God tells Samuel that he "does not look at the things people look at. People look at the outward appearance, but the Lord looks at the heart" (1 Sam 16:7), and unfortunately (as Jeremiah put it) "the heart is deceitful above all things and beyond cure. Who can understand it?" (17:9) Perhaps a more properly ethical way for us to judge our quarterbacks is to see them as incurable interception machines who are miraculously given to throwing touchdown passes from time to time. From that vantage point, Jay Cutler looks more blessed than most. Perhaps, then, with that kind of eye, we can even turn a more merciful glance to our own interception/touchdown rate.